Musicians Custom Sound Filters - Our Musician Sound Filters are custom made for each individual and have three available levels of sound reduction. 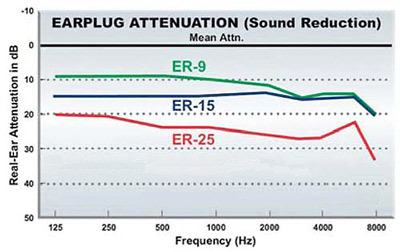 The filter systems reduce the sound level in an almost flat attenuation across the hearing frequency range. This means that the user will hear all of the frequencies in the music, just at a reduced volume. 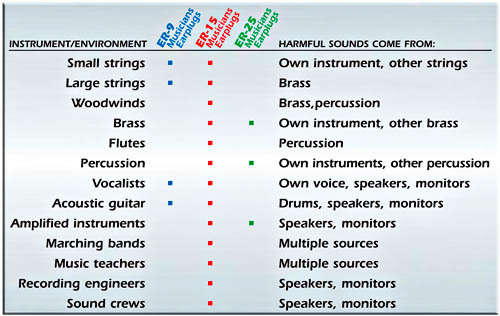 This of course reduces or eliminates the chance of damage to the users hearing. 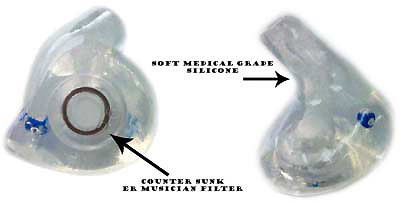 The foam style filters found in music stores and pharmacies greatly reduce the treble end of the frequencies, as opposed to the mid and bass frequencies, making the music sound muddy and unclear. The Custom Musician Sound Filters allow the user to hear music clearly. The Custom Musician Sound Filters are created by this process. A precision impression is taken of each ear by a licensed professional. The custom sound filters are then made from JB1000 medical grade silicone that will last for many years. There are 3 patented pass-through filters to choose from and one set is included with the Custom Musician Sound Filter Earmolds. The first filter reduces the sound level by 9 dB, the second filter reduces the sound level by 15 dB and the third reduces the sound level by 25 dB. The patented pass-through filters pop in our out so they can be changed whenever the sound environment changes. If the music is electronically amplified the 15 dB sound filter is a good starting point. We have musicians in our own family that use these Custom Musician Sound Filters.